Apples of Gold Jewelry plays favorites. 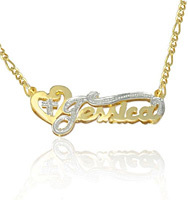 We love our cross heart necklaces and pendants, because we are a Christian-owned jewelry company with a mission to provide the highest quality jewelry an affordable price. As such, we only use authentic materials, like 14k solid gold or white gold and .925 sterling silver and make our crosses plain or make them with diamonds or gemstones (your choice). Every order comes with free shipping by UPS or FedEx and includes our signature 45-day return policy. Happy shopping! Please make Apples of Gold Jewelry your preferred online Christian jewelry company when it comes to the better stuff, like gold, diamonds, and precious stones! God bless!